Urban Grill 8" x 8" Aluminum Grill Discounts Apply ! Decorative return air vents are intended for floor, wall, or ceiling installation. These floor return air return grills are constructed of durable solid cast aluminum. The decorative return air vents have a striking hand crafted design, giving it a unique, non-machined look. The floor air return grilles are rust proof, making them resilient enough for indoor or outdoor use. Hand-cut decorative return air vents are available with or without a damper. To control the air flow from your floor air return grill, simply select “with damper” below in the drop down menu. Your decorative return air vents can also be ordered with or without screw holes depending on your needs. Screw holes for your vent cover will be needed for wall installation. You will also want screw holes if you want thicker carpet. Your floor wall vent cover will then stay securley in place. Purchase customizable decorative return air vents for your home today! You can even paint these floor air return grilles by covering in a coat of primer and then a coat of high quality paint. Please note that painted vents are considered non-returnable. - First, remove your existing register or grille and measure the vent opening in the wall. For instance, this grille is intended for a vent opening of 8" x 8". - The inside dimensions of the grille will be slightly smaller than the outside dimensions, so that the grille's frame fits into the recessed opening. The flange will fit flush on the surface and will completely cover the vent opening. This outer flange will house the various screw holes (if they are requested) to securely attach the grille. - Total outside dimensions of the grille are 9" x 9". - The faceplate thickness is approximately 1/4" and has a lip that drops in to the hole opening (varies in size). 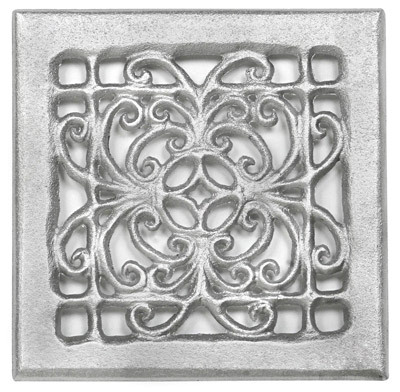 - Floor air return grill outside dimensions: 9" x 9"
Please be aware that there is a 3-4 week lead time for these grilles.